Halloween extravaganza 2012! 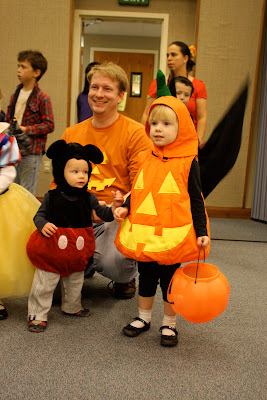 We started off the celebrations with Trunk-or-Treating at church on Saturday. 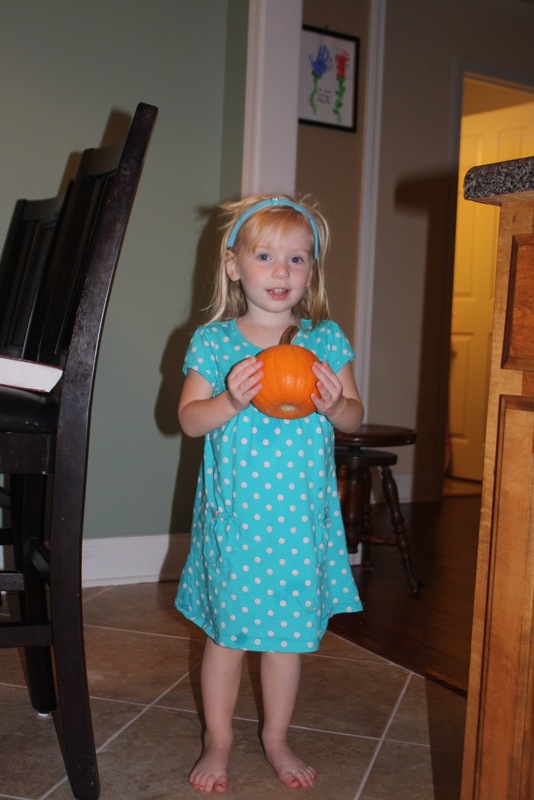 Sarah wore a pumpkin costume that Grandma Smith made years ago and saved for the grandkids. She loved it, but then that morning asked me what I was going to be. I told her a Pink Panther and then all of a sudden that's what she wanted to be too. 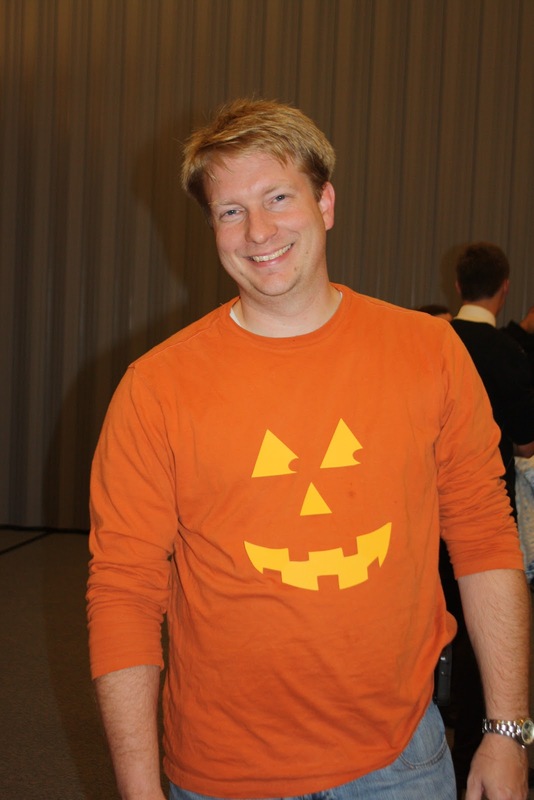 So I bought a pumpkin shirt, and Chris added a face to his orange shirt and we all went as pumpkins. 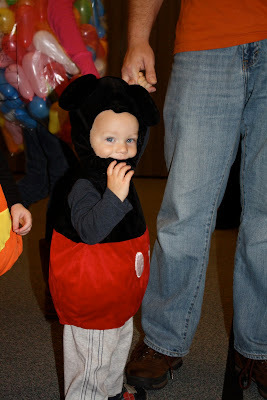 Except for Cody, I picked that Mickey Mouse costume up at a consignment sale. The ears squeaked! So cute! Yep, totally took this while someone else was taking a picture. That's why no one is looking at me. Trunk-or-Treat was so much fun. The had a cupcake walk in the Relief Society room. Sarah licked all the icing off and then was done. Cody was thoroughly enjoying bites of mine and daddy's cupcakes. So much so that he threw a fit when it was time to leave that room and then kept trying to turn around and crawl back into the glorious cupcake room. When it was time to go out and trunk-or-treat Sarah did a great job. I didn't have to remind her once about manners or etiquette. She said, "Trick-or-Treat" to each person and "thank you" after they put candy in her bucket. 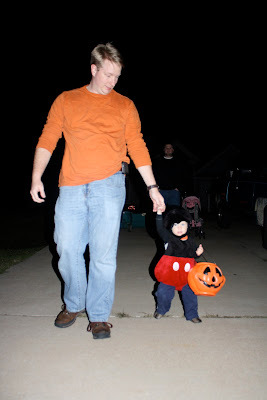 Then when it was our turn to pass out candy while Cody walked around with Chris she told everyone, "Happy Halloween!" as she put candy in their bucket. Well, to some people she said, "Happy Halloween! I'm a pumpkin!" in case they forgot I guess. Cody was so cute walking around with Chris. He looked so cute holding his pumpkin. After about the second car he figured out there must be something worthwhile going into his pumpkin so he dropped it on the ground and started digging through it. Sunday it was finally time to decorate our pumpkins! Sarah went and got their pumpkins off the porch. Please don't judge me based off her hair, she did it herself. Cody got the larger pumpkin that was supposed to be Sarah's because she deemed it "too big for Sarah". We bought a sticker kit for the kids to decorate with. Sarah picked out the face she wanted to do and Chris picked the one for the boys. Daddy demonstrating what to do. Cody loved it! He had a huge smile on his face as daddy helped him put the stickers on. 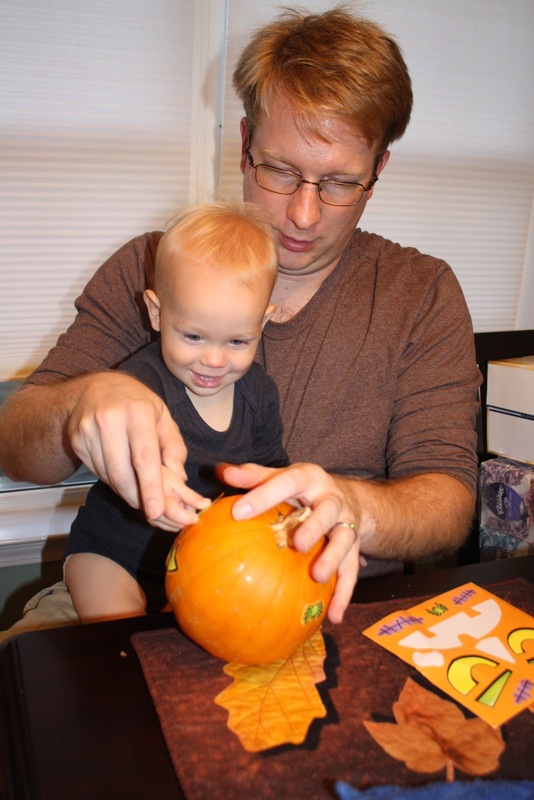 Chris would put the sticker on Cody's finger and then help guide it to the pumpkin. Halloween Time! We started the day dressing up for the Y. The ladies in the nursery take the kids trick-or-treating through the Silver Sneakers class. The Silver Sneakers are so sweet to the little kids. I learned from last year though to not let Sarah wear her real costume. Sometimes they do a little craft with the kids...last year it involved markers. Sarah got marker all over her white ghost costume. So she wore her cowgirl costume to the gym. It was cute, she kept tipping her hat and saying, "I'm a cowgirl! Yeehaw!" 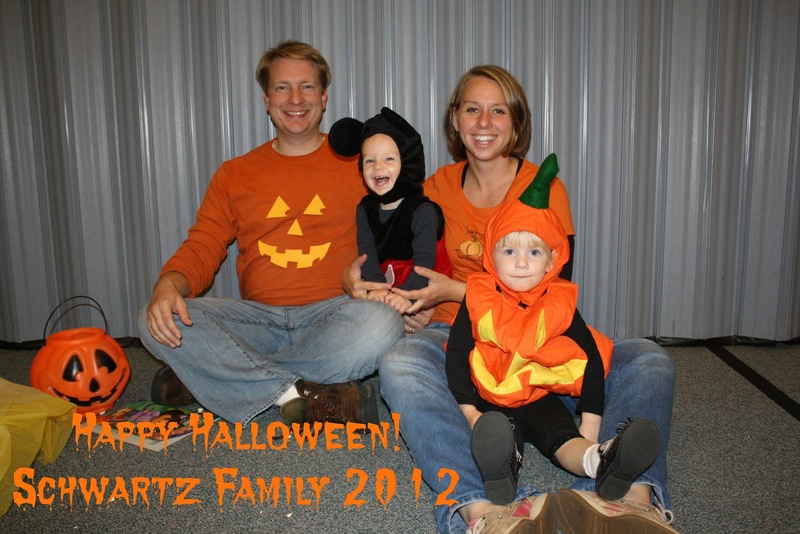 After dance class and dinner at Chick-fil-a it was time to meet up with the McKenzies for some Trick-or-Treating. Sarah was excited to see her friend Collin. "Look! I see Collin! He's a monster. Roar!" It's pretty impossible to get them to all sit down, sit still, and look at the camera while smiling. At the first house trick-or-treating. Did I mention how awesome my mom was. She also made a matching costume for her American Girl doll. She brought it over for Gracie to wear. So cute! I know this isn't a great picture but Cody just looked so grown up tonight as he walked up to the front doors and carried his pumpkin all by himself. Again he kept digging through it. I found him chewing on an unopened Milky Way at one point. That's when I had to take the pumpkin away. Not sure what I'm going to do with this kid. I have no idea how he figured out that he was getting edible things. Sarah never dug through her pumpkin. She still doesn't know you can eat suckers. She got one tonight and said, "Look mom! A fairy wand!"